But wait, aren’t vegans emaciated weaklings? 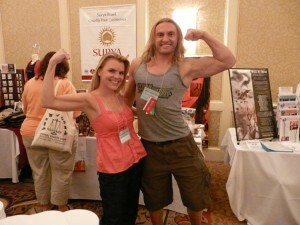 But anyway, on to today’s blog topic: Vegan bodybuilders and athletes! Folks like Carl Lewis, Ricardo “Mad Dog” Moreira, Brendan Brazier, Mac Danzig, etc. are out there showing that it is not only possible to have amazing stamina and muscle on a plant-based diet, but that they actually have an edge over their omnivorous competitors. At the AR2008 Conference this year I finally got to meet Robert Cheeke. He isn’t the only vegan bodybuilder out there, but he’s certainly the most well-known. I had a blast talking and working out with him, and we *may* have flexed our biceps for the camera a few times. Heh. Check out this great video taken at the conference. And yes, I’m in it flexing with Robert! 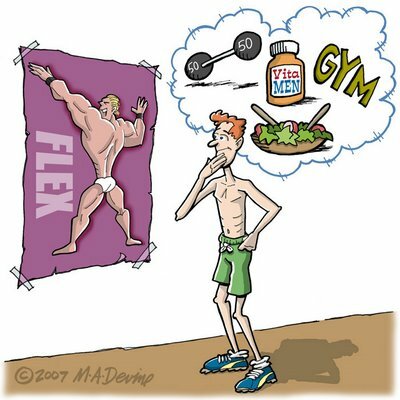 If you would like more information about vegan fitness and/or bodybuilding, be sure to visit Robert’s website, VeganBodybuilding.com. It’s got tons of great info and an active message board full of like-minded folks who love to discuss all things related to the vegan fitness world. Check out OrganicAthlete.org too. Thanks to all the great athletes out there that are putting an end to the negative myths about veganism.